Perhaps the single most powerful post-production tool that has emerged in the past few years is Blackmagic Design’s DaVinci Resolve. You may have heard of DaVinci Resolve as a color grading tool—it has a strong pedigree in color, and about a decade ago, you only would have seen it inside high-end post-production houses and finishing facilities, replacing the color timing workflows for film with cutting-edge digital intermediate workflows. However, it’s also great for syncing audio, preparing dailies, conforming, and in the past few years, has even started to offer tools for editing and sound mixing. The sound mixing tools are brand new, so the industry hasn’t adopted them widely yet, and the editing tools aren’t yet as robust as what you’d see from Apple, Adobe, or Avid, but they’ll suffice in a pinch. This whole collection of tools, together, makes Resolve one of, if not the most powerful tool in post-production. It’s the glue that holds the entire post-production workflow together. Blackmagic Design distributes DaVinci Resolve for Mac, Windows, and Linux with mysteriously aggressive pricing. Their price discrimination strategy is to include a vast majority of their features in a completely free build of Resolve, while simultaneously selling the larger and more serious post-production facilities with more advanced features, like mastering at DCI 4K (4096 x 2160), noise reduction, deinterlacing, and stereoscopic 3D. Blackmagic has avoided cloud-based subscription pricing, so unlike Adobe or Avid, they charge no recurring fees. Film restoration and dust removal tools ported over from da Vinci Systems’ Revival software. Since Apple declared Final Cut Studio end-of-life in 2011, post-production professionals have been loudly arguing about what software suites might fill the void—Apple’s own Final Cut Pro X, Avid’s Media Composer, or Adobe’s Premiere Pro. Most pros soon pivoted to one of these three, but few realized that a sleeper suite was already gaining traction. Almost two years before the NLE tumult of 2011, Blackmagic Design had already acquired da Vinci Systems, back in September, 2009. Tracking the search terms “da Vinci Resolve” or “DaVinci Resolve” in Google Trends reveals that interest in Resolve has been slowly but steadily increasing ever since Blackmagic’s 2009 acquisition, and that’s because they have poured resources into developing it into the product it is today. da Vinci Systems was hemorrhaging money back in 2009 when Blackmagic Design acquired it, and Resolve was just an esoteric tool for digital intermediate color grading on high-budget productions. Now, almost a decade later, Blackmagic has collected a smorgasbord of post-production tools into the program. As a post-production supervisor, my philosophy is to isolate technical work from creative work throughout the entire post-production workflow. I’m constantly considering how a comprehensive workflow should be structured so that each and every collaborator receives exactly what they need so that they can begin working efficiently. From the tiny bit of offline editing I’ve done in my career, I know that it’s no fun churning through an edit to find that a clip’s audio has accidentally gone out of sync; or for heavyweight codecs to stutter and throw weird errors; or to lose track of which clips need LUTs to transform log gammas and large gamuts into Rec. 709 or DCI-P3. 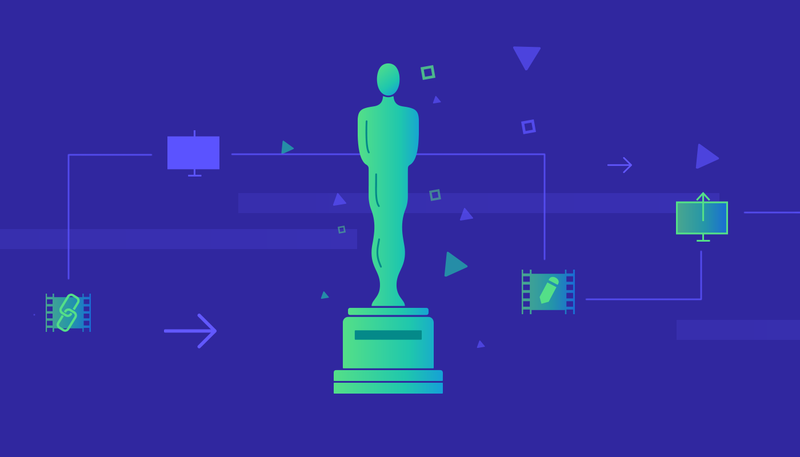 By editing in a lightweight proxy codec with a lower data rate, a single NAS can serve many more streams of video to its connected workstations than would be possible if users were to edit off of original digital negatives with higher data rates. When particular clips need to be shipped to offline editors at other facilities, proxies use less hard drive space, so more clips can be loaded onto fewer drives, or transferred via Aspera in less time. To directors and producers—“roll-up” dailies, which consist of single-clip exports from Resolve. I sync audio to video via SMPTE timecode (or, if necessary, use Resolve’s best-in-class audio sync capabilities), throw all the clips from each camera card into separate timelines, color correct them, add data burn-ins displaying clip names, video timecodes, audio timecodes, and camera roll names, and render out 1080p “single-clip” H.264 exports at 10 Mbps, which I then upload and share via the cloud. This is a great spot to use Frame.io in the workflow, so that directors or producers—no matter where they’re located—can leave comments about moments they like (via desktop or mobile device using the iOS app). To offline editors—full-resolution proxies, often UHD (3840 x 2160) or DCI 4K (4096 x 2160) for the “offline” portion of the online-offline workflow. From the same timelines I use to render out the rollup dailies for directors and producers, I can render out individual clips in ProRes 422 Proxy or DNxHR LB. These full-resolution proxies are color-corrected to Rec. 709, contain all of the original field recorder audio losslessly re-wrapped, and have file names and timecodes that are identical to the original digital negatives from the camera, which makes conforming easy after we achieve picture lock. To colorists—projects that are ready to be graded, immediately. After a director and editor achieve picture lock in Premiere Pro, I’ll pull an XML from Premiere Pro into Resolve, and use Resolve’s “offline reference clip” to compare the timeline of OCNs to ensure that every frame from the picture-locked cut matches perfectly. Resolve provides the tools for a proper, optimized, professional proxy workflow. Apple and Adobe’s marketing departments have long talked about how their software has allowed users to dispense with a proxy workflow. While this may be true for some smaller projects, a proxy (or online/offline) workflow is still vital to a high-end work. Back in the Final Cut Pro 7 days, there was never any pretense that capture codecs could be edited natively. I myself used what David Kong describes as a direct intermediate workflow for the Canon 5D Mark II — transcoding H.264 clips to Apple ProRes 422. For the generation of NLEs that succeeded Final Cut Pro 7, some claimed that FCP X and Premiere Pro were coded so optimally that you’d be able to import original digital negatives and get straight to work. They claimed that these NLEs could handle any kind of CPU-intensive, interframe compression codec, like AVCHD or H.264. This was true to a point, but it was a bit too optimistic. Importing AVCHD in FCP X. Upon initial launch, FCP X had the ability to quietly transcode clips in the background to ProRes and automatically swap all instances of the clips to proxies or direct intermediates. Adobe held to the online-only ideal until 2015, when they made a similar functionality available, allowing users to transcode clips and swap them with their original digital negatives. The problem with these background rendering tools within FCPX and Premiere Pro is that they just don’t fulfill the historical expectations of what digital dailies are supposed to be. Even if your NLE were to quietly transcode your CPU-intensive clips and swap them with lightweight files, your project would still be in a sad, disorganized state of affairs. You’d still need to juggle effects on each clip to debayer RAW files, or add LUTs or manual transforms for log gammas and wide gamuts. Audio clips from a production sound mixer’s separate field recorder wouldn’t be linked to the video clips in any reliable way. Using Resolve to create proxies means that offline editors don’t even need to think about any organizational hassles, CPU overhead for gamma and gamut transforms, or how dual-system audio might need to be synced. True proxies with embedded, synced audio will reliably produce out-of-sync indicators via the NLE UI, and no editor or assistant editor would need to trudge through each and every clip to “link” them manually. Even though modern NLEs are able to play CPU-intensive formats without dropping frames, they still suffer slight delays that occur when scrubbing through footage. Depending on the hardware specs of the workstation, those delays might be mere fractions of a second, or could even be as long as one or two seconds. While that might not sound like much, those little delays add up. Proxy formats like ProRes 422 Proxy or DNxHR LB are much more “scrubbable,” serving up frames instantaneously. For a producer/editor/colorist working alone on a project, it’s more feasible to run the entire post-production process through a single piece of software. But Resolve adds a level of reliability and precision that’s necessary for the robust post-production pipelines that I work on. In addition to being the “workflow glue,” Resolve is also an excellent color grading tool. Resolve inherits its core layout, functionality, and ergonomics from its origins in high-end color grading. It has the tools to painlessly import timelines referencing proxies from other NLEs and perfectly conform the edit into a timeline with full-quality original digital negatives. The proxies don’t even need to have the same file extension. DNxHR LB proxies with .mxf extensions or Apple ProRes 422 Proxy proxies with .mov extensions can be instantly swapped back to a wide variety of supported formats like RED RAW or ARRIRAW. If you plan your workflow deliberately, you can also non-destructively relink the same temporary grades created for the dailies back to the original digital negatives as a starting point for the finishing color grade. Now, with the increased viability and power of software-based systems, Resolve’s color grading capabilities are more powerful and affordable than ever. It’s difficult for youngsters to fathom now, but not so long ago, back on 2K Plus systems, each additional simultaneous power window required its own $50,000 board. In 2009, Blackmagic Design CEO Grant Petty explained that the most expensive da Vinci Systems deployments had cost about $850,000, and he was trying to figure out how they might drop the price of new systems to $500,000. All that has changed. For years, Blackmagic Design has spoiled us with a free version that has most of the functionality of the $1,000 Studio version (the free version of Resolve provides an unlimited number of power windows), and now with Resolve 14 (currently in Public Beta), they’re dropping the price of the Studio version to just $300! Resolve also inherited the guts of another da Vinci Systems product named Revival, which has tools to repair dust, dirt, and scratches in frames from telecine scans. This used to be a standalone application, but now its features are bundled right into Resolve. Providing the Revival tools inside Resolve fits into a larger comprehensive strategy around film and telecine, because Blackmagic Design also acquired Cintel in 2012. They provide a complimentary copy of Resolve Studio with any purchase of their $30,000 Cintel scanner. It’s difficult to grok without some hands-on experience, but all of the ergonomics of Resolve’s design mean that, in addition to excellent workflow tools, it provides high-end tools for color grading and overall finishing. Yes, Avid, Adobe, and Apple provide many similar tools, but they’re not quite optimized in the same way. To get a rudimentary sense of how much faster and more effectively color grading is in Resolve, you can view Casey Faris color grade the same scene with Premiere’s Lumetri panel and Resolve. Though Blackmagic Design has spread the software-based Resolve to the masses, they still continue to integrate and support some of the most powerful, cutting-edge hardware available. Ideally, Resolve users should nourish their workstations with as much CPU and GPU power as they can. The configuration guides for Resolve 12.5 and Resolve 14 detail some impressive hardware support. On [2012 and earlier] MacPro5,1 machines, a Cubix Xpander can connect to a PCIe slot to harness multiple, powerful, modern NVIDIA or AMD GPUs without running up against the Logic Board’s power limits or the need to blast the internal fan aimed at the PCIe slots. On  MacPro6,1 machines, even the free version of Resolve will take advantage of both built-in D500s or D700s. On Macs with Thunderbolt 2 or Thunderbolt 3 ports, “eGPU” enclosures from Sonnet or Magma allow users to run the latest and greatest GPUs from NVIDIA and AMD, despite the standard PCIe form factor. Rob Art Morgan at Bare Feats has extensively tested the performance gains with such eGPUs. As an aside, the next release of macOS, High Sierra 10.13, supports Thunderbolt 3 eGPU natively, so even if the upcoming iMac Pro’s form factor doesn’t lend itself to upgrading the internal AMD Radeon Pro Vega GPU, you won’t necessarily be stuck with just that GPU when it eventually becomes obsolete. In an HP Z840, the CPU they recommend is a Dual Intel Xeon E5–2697 v3 (dual 14 core). In a Supermicro SuperServer 7048GR-TR, the CPU they recommend is a Dual Intel Xeon E5–2698 v4 (dual 20 core). For those who want to build their own custom Windows PCs, they recommend a particular ASUS motherboard with an Intel Socket 2011-v3 Core i7. Resolve already provides an impressive, comprehensive toolset to manage workflow, prepare dailies, and color grade; but it’s also quickly gobbling up sound mixing and editing features. I can’t expand on Fairlight too much yet, because the features are only in beta, but Blackmagic Design acquired the post-production audio company Fairlight last year, and has incorporated the guts of the DAW into its own audio tools in Resolve 14. It looks like it just might become a viable competitor to more established DAWs like Pro Tools, but time will tell. Copyright Blackmagic Design Pty. Ltd. 2017, all rights reserved. In Resolve 9, the GUI had a page named “Conform,” but when they shipped Resolve 10, they changed the name of that page to “Edit,” and ever since, they’ve been deliberately filling it out with features to compete as a full-fledged NLE. 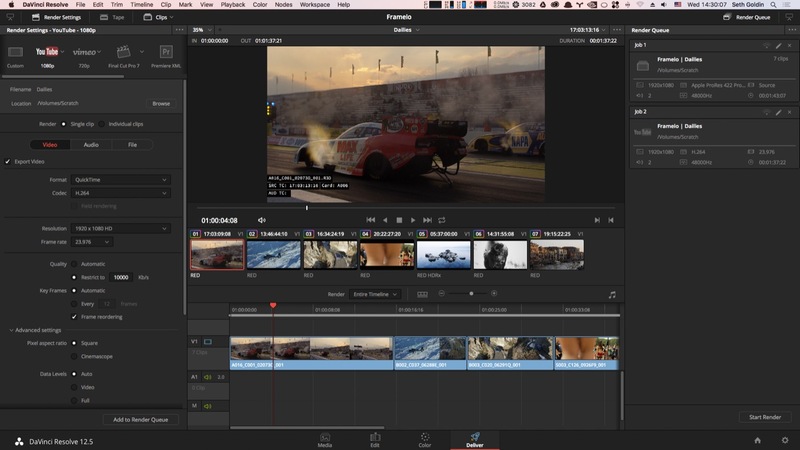 For years, they’ve been hard at work replicating the standard editing tools you might find in Media Composer, Final Cut Pro, or Premiere Pro, and it looks like in Resolve 14, they’re finally getting close. Resolve’s Edit page now has most everything you’d expect within one of the other NLEs: a browser to view bins and clips, a viewer for source clips, a viewer for the timeline, and a timeline itself with audio and video tracks. The Edit page supports multicam editing, nested sequences, and even compound clips similar in functionality to the compound clips you’d find in FCPX. The Edit page has standard edit operations: Insert, Overwrite, Replace, Fit to Fill, Place on Top, Append at End, and Ripple Overwrite. It supports three-point editing, four-point editing, and sub-clips. It also has a great “take selector” feature, in which you can stack different takes on top one of another to audition different takes, and have different options at the ready. In some ways, Resolve’s editing tools have been laughably behind the curve until now—Resolve 14 is the first time a user has been able to have multiple footage bins open simultaneously. In other ways, Resolve’s editing tools are faster and more powerful than its competitors. Whereas FCPX’s unique advantage is its magnetic timeline, Resolve has a unique “Dynamic Trimming” tool — just by choosing where to click the mouse gives you the power to ripple, roll, slip, or slide, without having to click another button in the GUI or press a key on the keyboard. 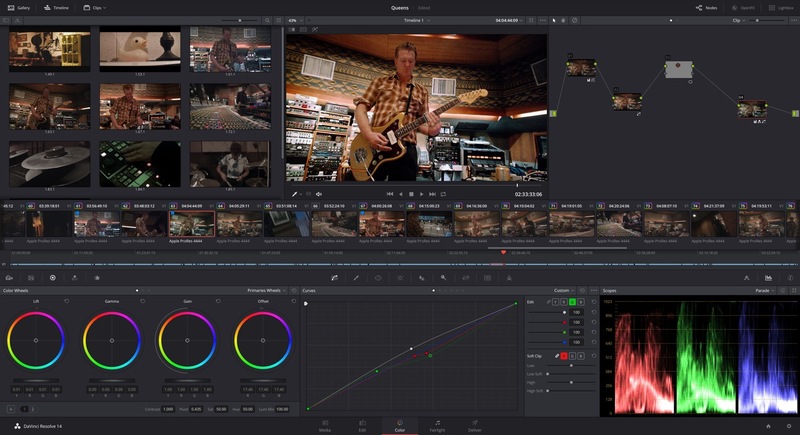 Resolve is the glue that can hold a high-end workflow together, is optimized for high-end hardware, and is adding amazing functionality every year. The Resolve manual, written by none other than Alexis Van Hurkman, author of the canonical Color Correction Handbook, has some of the clearest and most comprehensive technical writing in the world. The Blackmagic Design support team, in my experience, has made themselves highly available, responsive, and empathetic. Seasoned professionals monitor the Blackmagic Design user forums for any strange questions that might arise, from newbies and experts alike. Most amazingly, Resolve is free, and Resolve Studio is cheap! Its flagship tools are extremely effective, and soon it may just function as an all-in-one post-production suite. If you haven’t tried Resolve, what are you waiting for?